I LOVE ice cream. Some of my favorite memories are of me and my family eating ice cream. When we were kids, my mom loved to make homemade ice cream in a bucket that had an old fashioned crank. My brother and I took turns until our arms nearly fell off and then it was up to dad to finish the job. It was a lot of hard work but whenever she started dishing up the ice cream all thoughts of sore biceps were forgotten as we engorged on that whipped, creamy goodness. When we first moved to Samoa from the United States, I remember driving into Apia on the back of our pick-up truck. We were all crammed in there, the light tropical wind blowing our hair in a dozen directions, the salty mist blowing in from the harbor and only one thought on our minds – ice cream at Isa’s Ice Cream Shop. It was a bonding moment that pushed aside any petty differences, disagreements or mischevious thoughts. When you had an ice cream cone in your hand, everyone around you was your best friend. Nothing makes me feel like I’m closer to heaven like a bowl of ice cream. Think about it – When you are angry with someone what is the first thing you say to them? Let’s go get an ice cream and talk about it. Right? When you feel like slapping that loud and annoying woman on the sidelines at football games because she just called your son a ‘fairy’ what do you do? You ask her if she wants some ice cream…then you slap her. When that guy at the plumbing supply store gives you the wrong part to repair your toilet for the third time in a row what do you suggest that he do? You tell him that he needs to eat more ice cream because it will clear his mind…and his plumbing. “I had a bad day at school today” — No parent wants to hear that and the first thing you want to do is drive down to the school, have them point out the bullies and smack every one of them upside the head. Now who’s the bully? Instead, scoop out some Rocky Road, tell them there will be good days and there will be bad days. Life on the playground is every bit a learning experience as the things you learn in the classroom. Ease into the conversation about finding good friends who will love and support you through the rough times and smile with you on the good days. Even the popular kids have bad days. Let your kid know that they are loved and that you are always available to talk and give them support. “I can’t seem to make up my mind about one thing or the other” — Pull out the Neapolitan, sit your kid down and as they dig into that yummy mixture of vanilla and chocolate separated by that pink, luscious mediator strawberry you tell them that we all have different ways of doing things. Sometimes we have so many options, so many moral dilemma’s that our minds have a hard time sorting through the mess. No worries, sometimes the only bad decision is not making a decision at all. So consider all the positives and negatives, make a decision and we’ll stand by that decision together. “I’m going to miss you guys so much!” — Wedding? College? Just moving to another city or State for an opportunity? They are all major steps in a child’s life. Sit down and have a bowl of Sherbet with them. Technically its not ice cream but its cold, it tastes good and though it is bitter and sweet at the same time, it kind of defines this moment in your life. As your parents we’ll be sad to see them go too, but think of all the wonderful things that are about to happen in life. They can always come home, but we can’t keep them from experiencing the best that life has to offer. Isn’t it great? 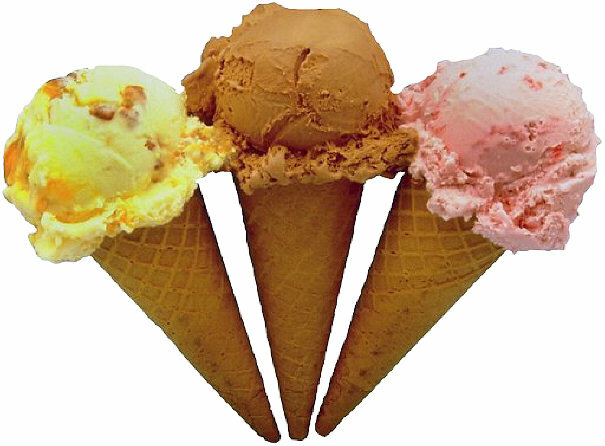 Ice cream is the perfect ice-breaker (no pun) when dealing with difficult conversations with your kids. It is also the perfect memory food. Years from now when your kid is sitting with their own kids and talking about life while chowing down on a bowl of ice cream, you’ll reminisce about similar times that you had with your own parents. Just ate some ice cream last night…my son informed me that as a first grader he has 2 recesses at school but if you eat your lunch fast enough you can play the rest of the time, so it is like 3 recesses. Love the conversations over ice cream. Now that’s a kid who is thinking outside of the box! Thanks for sharing. I think you forgot about this one: “We want to hang out with you guys, so we’re inviting ourselves over for some ice cream”. LOL – Best comment so far. Thanks Sunny! Love this blog! I swear we had similar parents. Dad used to make homemade vanilla ice cream when we were kids. Vanilla is my fave ice cream because of the many happy memories as a kid. I find myself reaching for the ice cream as well in times of need. 🙂 thanks for sharing! Lately I’ve been trying not to reach to often because it’s starting to show around the waist (or was it always there? ka’ilo). But the teaching opportunities are always available regardless. Thanks for sharing!